The day was forecast 40% sun but it didnt look too promising peeking out window from under the covers in my bed. Eventually my conscious starting playing on me for being lazy and we headed up the Midi with hope the forecast was right. The lifty on the bin said we were the first skiers of the day which was slightly surprising as this is Chamonix at the most exciting time of year for a skier and a bin had gone up before us. 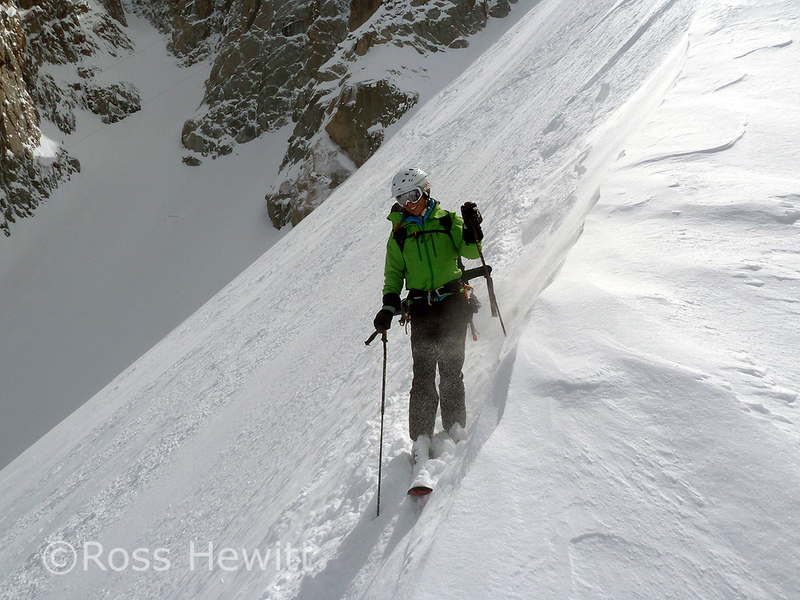 Walking down the Arrete the mist started to part revealing a pristine sparkling wonderland with its new coat of pow. 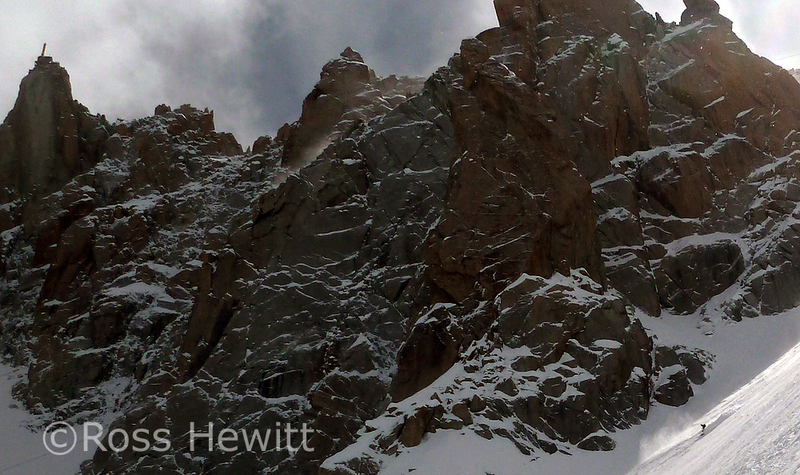 I never fail to feel a twinge of excitement going to ski on the Midi. 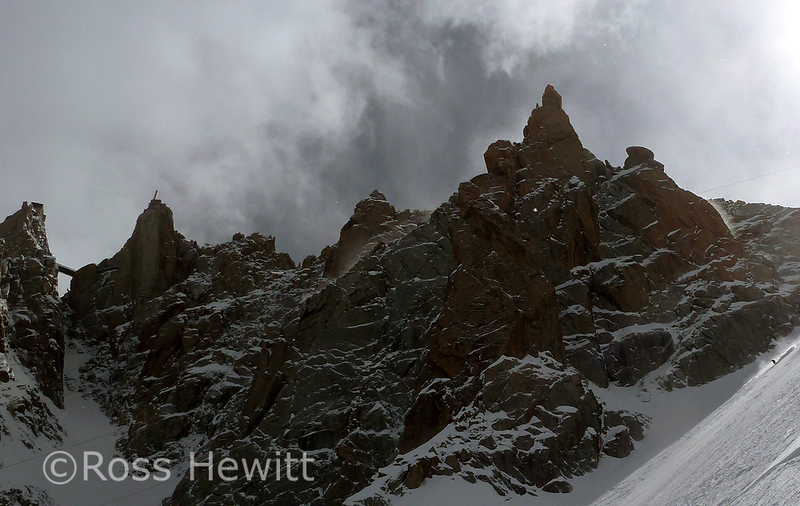 Unlike a ski resort the Midi offers adventure, doubt, excitement (read sphincter twitching fear), risk and reward. You end up skiing in outrageous places – the stuff dreams are made of. 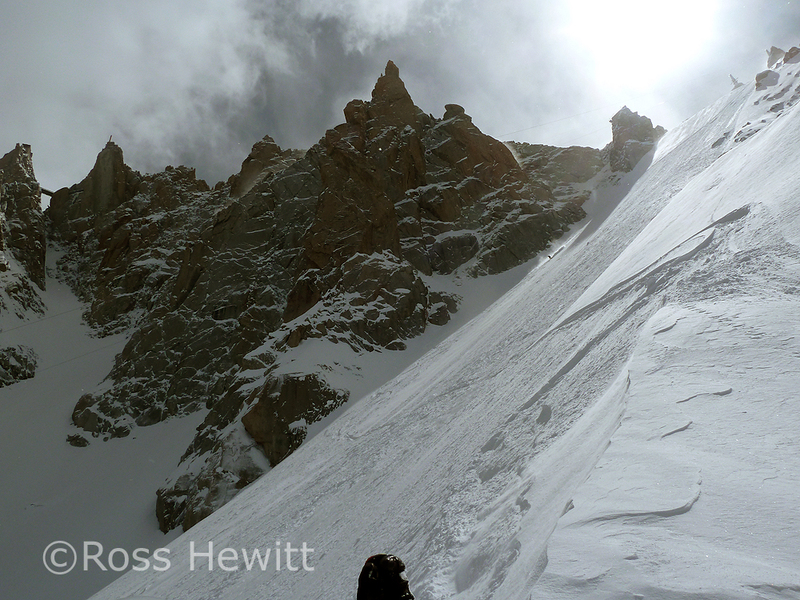 A guide was working on the arrete removing the fixed ropes and expressed concern that we were going skiing. Its not like I haven’t been up the Midi a 1000 times but I guess they have responsibility to warn people of the dangers given the number of inexperienced people that disappear up there questing of into the unknown. Maybe I just looked like a punter walking down rather than skiing. It does always make a little part of me question my decision making and that can be unsettling. I spent a few seconds thinking about it and off we went. Anyway the Rond was getting better with every run and with a topping of 30 cm made for fast fluid skiing in fresh tracks. Bit by bit the North Facing stuff is coming into condition. 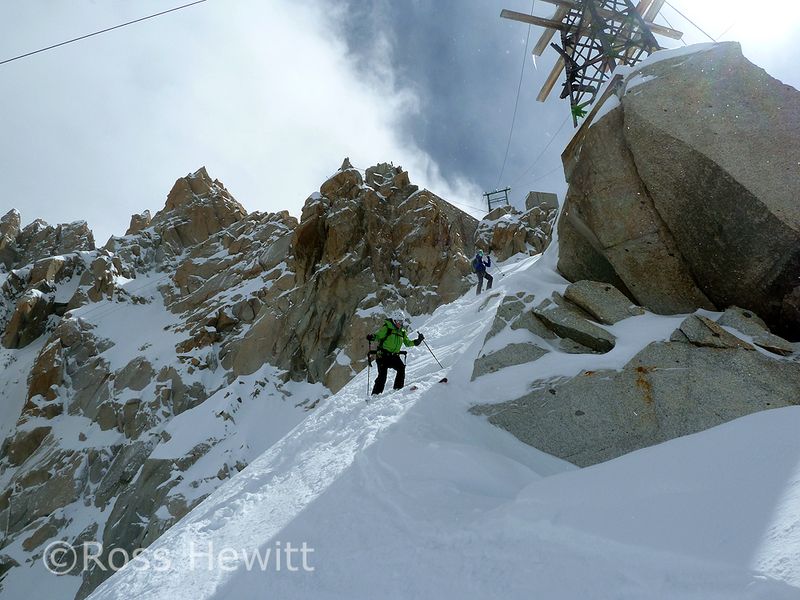 Its a shame Grands Montets closed on Tuesday! 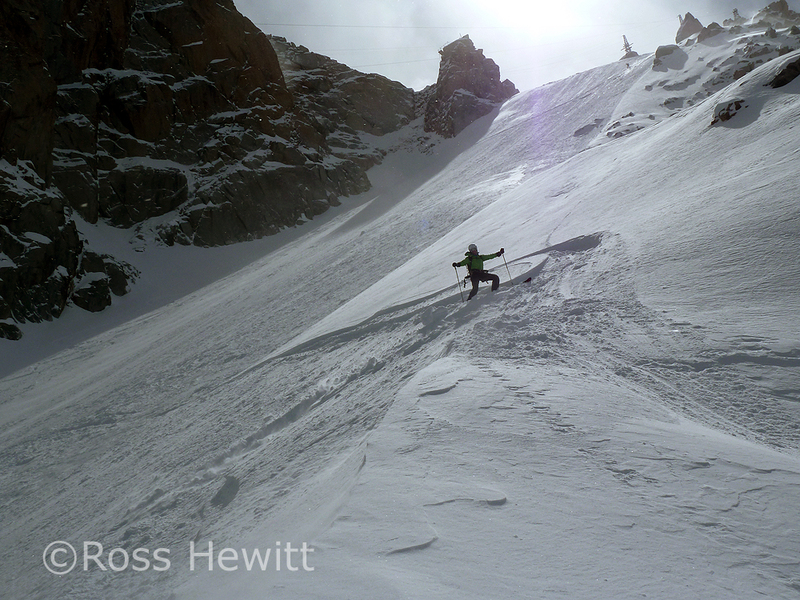 This entry was posted in Skiing and tagged Aiguille du Midi, alps ski conditions, アルプス, スキー, スノーボード, フランス, フリーライド, beau, Chamonix, Chamonix conditions, Dave Searle, Монблан, большой линии, горы, лыжах, 過激な, 雪, France, Freeride, Lyndsay Meyer, Montagne, Mountains, neige, pente raide, powder, rad, raide, Rond, Scottish Skiing, snow, Steep Skiing, مسحوق, 急, التزلج على الجليد, الجبال | by Ross Hewitt - Skiing, Climbing, Photography. Bookmark the permalink.